The Puzzle Cube (see drawing below) was created to demonstrate that a complex message or set of instructions can be transmitted via a simple mathematical protocol (and also to prove that many can be lead astray by the same information). The cube itself was designed as an analogy for the Great Pyramid, which, many believe, is a message from distant ancestors. The difference between the two, is the Puzzle Cube has a solution, which is a single word in common use in the English language (and, occasionally, in others), whereas it appears the pyramid’s information must be understood in the correct sequence, and, perhaps as a result, has yet to yield a solution. The cube is a two-stage puzzle in as much as it must first be understood and then followed up. The follow up stage was created to help track the progress of those who are currently studying the cube. The “key” to the solution (but not the solution itself) is contained in the legend of the cube. Once understood, the legend should prompt a simple but logical question. It is the answer to this question, which leads to the solution. How to play: Study - but do not scale - the drawing and this text and see if you can decipher the cube. The best approach would be to develop a theory and then test it by playing with the cube’s format and dimensions. Having confirmed one piece of the sequence, the remainder should fall into place relatively easily. If the cube “speaks” to you, its legend should prompt a single logical question. All you have to do is ask the right question (write to me at the email address provided). The answer should lead you directly to the solution. Please write and tell me you are attempting to solve the puzzle, I’d like to keep track of how many are trying. Conceptual Questions: I’ve tried to be as accurate and comprehensive as I can, but there may be one or two concepts which are not as clear as they could or should be. If you’re not sure about a given aspect of the puzzle, please feel free to contact me for clarification. Please note that information which may give you an unfair advantage will be provided to all known players (via direct email or by way of updates on the message board). The Clues: By far the most important clue is the fact that, unlike more complex puzzles, this one can be approached from any angle, with each piece of information contributing to the whole regardless of the sequence in which it is discovered. The format and dimensions of the cube are intended to carry the researcher on a journey of discovery (but there are clues scattered throughout this entire text). The cube has been endowed with some provenance (see Legend below); to provide cryptic clues that will lead the researcher to the correct question and red herrings to lead others away. Study everything closely and ask yourself questions. If the cube answers your questions you are probably on the right track – all you have to do is get into the station. The single word solution to this puzzle is not contained anywhere in this text or on the drawing. The Legend: The cube was found in an underground vault, where it was evidently cradled in crystal. Unfortunately the crystal shattered when the vault was opened and attempts to reconstruct it were unsuccessful. Local tradition states that the cube is “ageless” and was created to commemorate the reigns of a series of “white haired rulers” and supposedly foretells the end of each reign. After each subsequent coronation, the cube was relocated to begin counting the years of the new reign. It is believed by many that “white haired rulers” refers to mortal (and presumably aging) kings/queens who will, eventually, be replaced by an “everlasting” king/queen (perhaps both – all references appear to be plural). Locals believe that the cube can only reveal its secret by “speaking” to one individual, just prior to the end of a given reign. The cube was donated to the British Museum, which has continuously loaned it to other museums and institutions throughout the world. Scientists from many disciplines have studied the cube, but, so far, they have been unable to agree on a solution. The Cube: The body of the cube appears to have been manufactured from a uniform block of unknown material whose dimensions were 25.360 inches square, but it has a cut or compressed “length” of 25.276. Weighing an estimated 1,300 lbs., the cube does not corrode or tarnish and is completely solid. Each of its six faces exhibits some minor roughness, but this is almost microscopic in nature, limited to about thirty percent of the total surface area and does not detract from the attractive, grayish blue to brown sheen the cube exhibits under bright light. The cube conducts electricity and has a magnetic field that fluctuates slightly whenever it is re-oriented. The Bosses: Each “end” of the cube (assuming the short dimension to be the length) features small raised “bosses” of differing sizes. On the X face the boss is a shallow, uniform dome rising just barely above the face, and which appears to be situated exactly over the cube’s axis. On the Y face, however, the boss is much larger, is offset considerably toward the A face, and, although also akin to a shallow dome, is several times higher than its opposite. Both bosses exhibit what appears to be impact and/or abrasion damage. On the X face boss, what appears to be abrasion, radiating from its center, is found around its entire circumference. On the Y face, however, the damage (if that is what it is) occurs chiefly as dents and protrusions over its entire domed surface (similar abrasion of the edges is evident, but here it is limited to a small percentage of the circumference). Both bosses are microscopic protrusions that appear to expand and contract slightly whenever the cube is moved. This has made it impossible to measure their actual dimensions accurately. The Channel: This feature is perfectly straight and runs from the center of the X-face, via the A-face, to the center of the Y-face. It is a uniform 0.281 inches wide over its entire length but its depth appears to have been deliberately modified. There are some areas, particularly along the majority of the A-face and close to the center of the Y-face, where it is little more than a shallow depression. In the remaining areas it is a deep V. In both cases, the actual depth varies so much it has been impossible to quantify. The Corners: The cube’s corners have been removed to form triangular facets. They are nominally uniform, but their edges are much cleaner and more defined on each of the A, B, C & D faces than on the X & Y faces. Each of the eight cuts can be measured accurately on faces A through D (where they are identical), but only an average (measured from the apparent axis) can be ascertained for the X & Y faces. 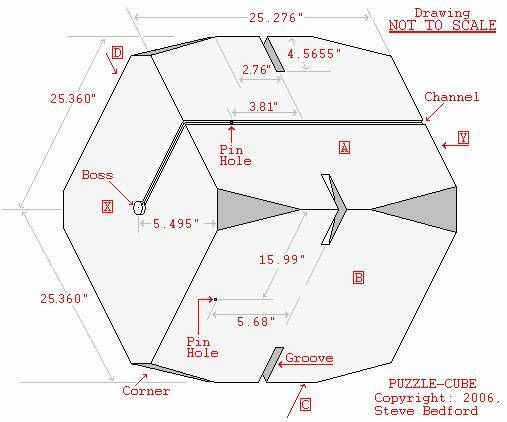 The Grooves: Although all four grooves are placed exactly on the cube’s centerline, not one is identical with another, except where their surface “reach” (distance across each face) is measured, in which case all eight dimensions are consistent to four decimal places (4.5655”). The Pin Holes: The “Pin Holes” are actually connected! A single, perfectly straight hole passes through the block from the center of the groove in the A-face to a point (noted on the drawing) on the left side of the B-face. This hole is so tiny that its true diameter has never been determined, and only a bright light placed at one end confirms that it is continuous through the Cube. Study the cube and all of the above carefully. Keep notes and confirm your thoughts, theories or suspicions (by all means keep me informed of your progress, but don’t expect any unfair help!). You should soon reach a point where the cube has given you almost everything you need, leaving you with one inescapable question. The answer to that question will lead you to the solution. Claiming your Prize: Dr. John has graciously donated a copy (electronic download) of The Complete Pyramid Source Book as a prize for the first person to solve this puzzle. That prize will go to the first person to provide the correct solution after asking the correct question (all those who ask the correct question will be given the correct answer). I will post the winner’s name on this site as soon as they have contacted me with the solution. Additional honors will go to those who can provide a complete (or as close as possible) account of what each feature of the cube represents. As soon as the puzzle is solved, I will publish a full account of the details (along with an explanation of the cube’s relationship with the pyramid) on this site. Good luck! Thank you for playing. Copyright © 2006 by Steve Bedford - All Rights Reserved: Except for the purposes of personal attempts to solve this puzzle, no part of this publication may be transmitted, reproduced, stored in a retrieval system or offered for sale, rent or reward in any form without the written permission of the author. For a personalized copy of this puzzle, or information regarding the transfer of publishing rights, please contact the author at the email address provided.